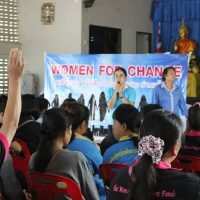 2017, September 14 – Now in its second year, the Women for Change Programme (WFC), a project which strives to empower women by increasing their knowledge of gender-based violence and the reporting procedures of cases of abuse, as well as teaching counselling and leadership skills, is already behind a great number of accomplishments. These include the election of women as village leaders, the successful establishment of local social enterprises and the formation of a strong network of women who watch out for and report cases of abuse that occur in their communities. 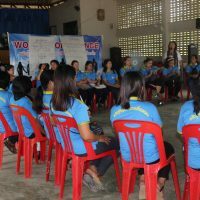 Earlier this month Center for Girls conducted a workshop as part of its Women for Change Programme which was attended by women from all 23 villages in the sub-district of Huay So. 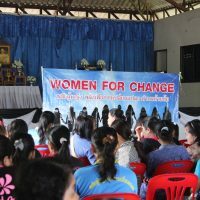 The group of women leaders participating in the Huay So WFC project were joined by a number of women from each of their villages so that a total of around 150 women were present and engaged in actively pursuing a positive change in their lives. 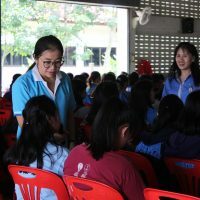 Together they discussed the underlying causes which undermine their efforts to achieve gender equality, identified the problems which impede their pursuit of equal rights, and brainstormed ways to tackle them. 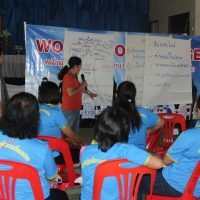 The event was concluded with a number of promising ideas for the next step in which the women would independently implement a project that directly addresses an issue they identified as a significant obstacle, and indeed a few days later, in a second focus group facilitated by Center for Girls, the participants decided to establish a social enterprise to produce handmade soap. Expected to generate income for the local women it would reduce their financial dependency which had been recognized as a factor impeding the advancement of women’s equal status within their communities.